Back in 1956, 15-year old Kathy Kohner bumped into a group of Malibu Beach surfers––sun-baked men in cutoff jeans, hanging around a shack made of palm fronds and driftwood. She asked if she could borrow one of their boards to try whatever it was they did. Humored by the teen pixie, they loaned her a board––and the seed of a new culture was planted. When Kohner emerged from the water after her first ride, surfer “Tubestake” Tracy, along with “Moondoggie”, “Bubblehead” and “Beetle”, dubbed her “Gidget”, a fusion of ‘girl’ and ‘midget’. Soon after hearing his daughter’s exhuberant accounts of how surfers get “jazzed” and “stoked” when catching a ‘bitchin’ wave, Kathy’s father, Hollywood screenwriter Frederick Kohner, was prompted to write a book about the surfer sub-culture, a fictional tale called “Gidget”. It was an instant best-seller. It didn’t take long for the book to be turned into a screenplay by papa Kohner and Gabrielle Upton. Two years later, Columbia Pictures released the “Gidget” movie starring Sandra Dee, inspiring “Gidgetmania”––a culture revolution that including “surfing-sound” music and the Beach Boys, a film series of popular Annette Funicello-Frankie Avalon “Beach” gender spin-offs, and the popularization of the sport of surfing. Kids around the world were “California dreamin’. Surf, sun, and sand, the Beach Boys, Pacific Coast Highway, and the Big Kahoona. Nostalgia buffs recall that “Gidget” motion picture sequels were “Gidget Goes Hawaiian (1961), starring Deborah Walley, and ”Gidget Goes to Rome” (1963), starring Cindy Carol. On the small screen, Sally Field starred in the 1965 “Gidget” sitcom, and Caryn Richman was “The New Gidget” in the 1986 entry. 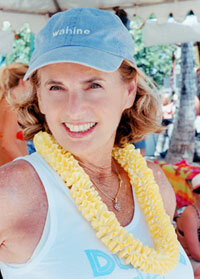 In 1999, Surfer Magazine, the ‘bible of surfing’, named Kathy Kohner the 7th most influential surfer of the 20th century. In 2004, she was named “patron” of the Rip Curl Malibu Pro Women’s Championship.